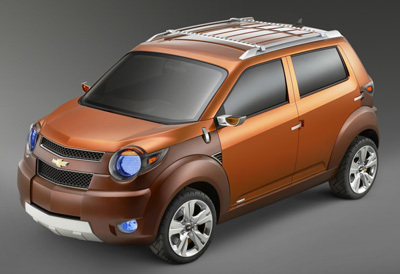 The Chevrolet Trax was one of three global minicar concepts GM unveiled at the 2007 New York International Auto Show. The Trax was designed, along with the other two concepts, at GM's Design Studio in Incheon, South Korea, one of GM's 11 Global Design Studios. The Chevrolet Trax was designed to be an urban crossover concept that's equally at home on the trails or in traffic, it gets a low-cost all-wheel-drive system and looks the part of a rugged SUV many times its size, thanks to a voluminous one-piece bumper and fender system in the front and back, a rear-mounted spare tire and a roof rack. 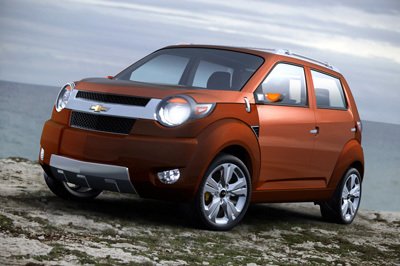 The four-door Chevrolet Trax concept is powered by a 1-liter gasoline engine. 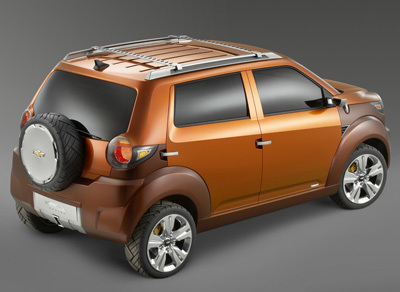 The upper part of the exterior is bathed in Blaze Orange, while lower corner panels sport a Burnt Orange matte finish.